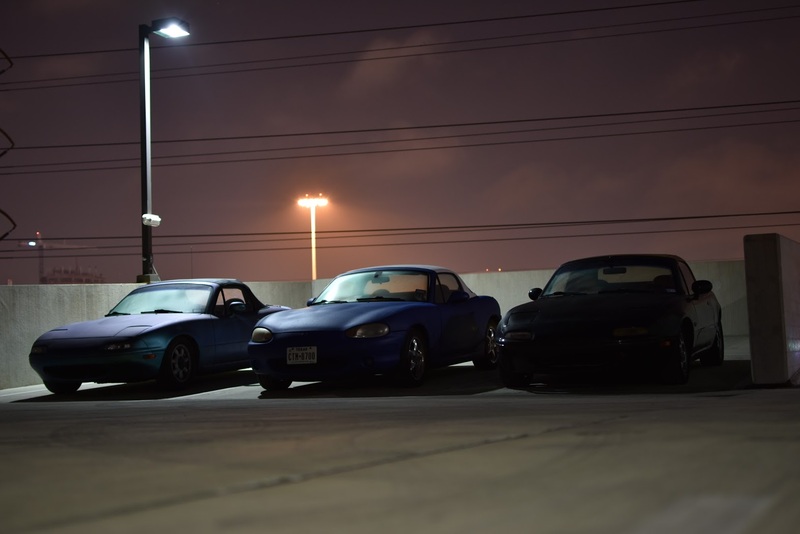 The Miata Guy – Everything Miata. Tips, tricks, repair guides, and more. Everything Miata. Tips, tricks, repair guides, and more. This was a fun one. Leaving work one day, rounding the first corner, I depress the clutch and a loud grinding noise happens. Try again, happens again. Took a couple time, but realized that the starter was trying to engage. So I stop, check if anything looks crazy under the hood (it doesn’t), notice I don’t have any tools to disconnect the starter, and investigate a little further inside the car. While inside the car, I get some electrical burning smell, just enough to know it’s from the inside, but not sure where. I make sure the fire extinguisher isn’t too secure next to me. I also notice it only happens when the clutch is fully depressed, meaning it’s depressing the clutch switch to start. I hobble the car home, making sure to only press the clutch in just barely far enough to disengage, but not press the clutch switch. My first hunch is the ignition switch. It’s the only thing that should be controlling the starter and the only thing caring about the bottom clutch switch. I rip open the steering column, and while looking at the ignition switch, when the car is turned on, you can see a spark, followed by glowing red spot, inside the plastic. So replace the ignition switch, try again, and no glowing red burning. And no more starter cranking with the clutch depressed. This is for a 128k NA Miata. I was getting little misstep/bog down at idle, but when driving at higher RPMs the car seemed to be driving fine. This lasted for a couple days, then I lost what felt like nearly all power accelerating and slight missteps during higher RPM cruising. Then finally, after a hard acceleration up to highway speeds, the car threw a flashing check engine light and read as P0303, misfire on cylinder 3. First step, checking for spark from the plug wires. With the car running, I pulled each plug wire from the spark plug and placed the end near a valve cover bolt. Checking to see/hear if there was a spark. All sparked except cylinder 3. 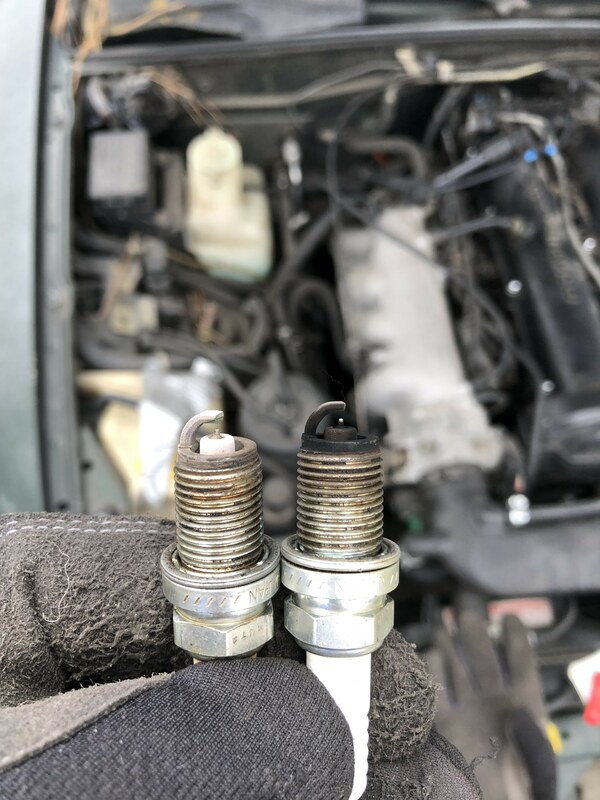 Pulled the wires from a different car, and also pulled the spark plugs. All plugs looked good except cylinder 3 being fairly fouled. Which might mean this has been happening on some scale for a while, which makes me wonder if this could’ve been the source of my intermittent P0420 code this whole time. Tried running the car again. Ran correctly for about 15 seconds then the misstep came back. And again no spark on cylinder 3. Onto the coil packs. Miata coil packs varied between years, so neither of my other Miatas had usable coil packs I could test with. So I switched the coil packs arounds. Switching the (for my year) 3 pin connectors then switching the plug wires to match the new coil packs. Instead of 4 1 2 3 order, it’s now 2 3 4 1. So if it was the coil pack, I should be getting no spark on plug wire 1, but getting spark on 3 now. Which is exactly what happened in my case. $83 Amazon purchase later, I got a new Delphi set of coil packs and replaced them. Amazon was nearly half the price of any other place including eBay, which were selling used ones for the same price and higher. 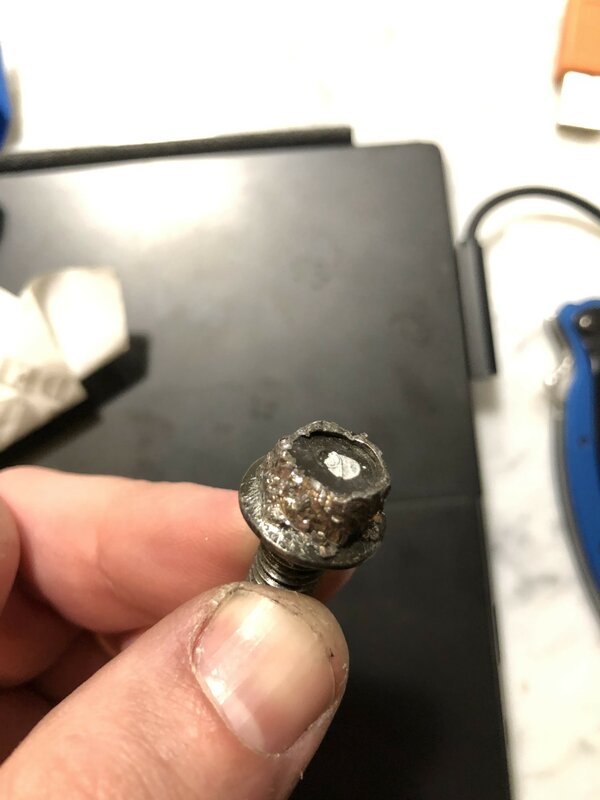 During replacing them, I found the working coil pack was not connected to the mounting bracket whatsoever, and the 1 bolt that was used to connect the bracket was completely stripped by a wrench. So I’m going to guess the previous owner replaced the 1 coil pack, did a poor job of it, and didn’t want to spend the money or do the work to replace the other coil pack with it. I also have not gotten my P0420 code for the past week of driving it, so maybe this also fixed that. First, buy one of these parts off of Amazon. Don’t question it. It’s $12. Do it. As someone who fought this code for months, did everything else listed in this, including testing this part and it seemingly working, changing this part fixed it. There’s a very good chance you can buy that, replace it, and never worry about this again. But if not, I’ll go through other steps and explain what this code means. So our MAP sensor is out of range. But wait, don’t Miatas use MAF sensors and not MAP? Sure do, but NB Miatas have something called a boost sensor. For our cars with zero boost. This is the MAP sensor. It’s used to control the EGR. The boost sensor connects to the boost solenoid (that part I linked to before) which regulates the air going into this sensor. One simple way to see if your boost sensor is working is by bypassing the boost solenoid and running the vacuum line directly from the manifold to the sensor. Your idle should be significantly higher than normal if it’s working. If it didn’t change, don’t go buying that sensor just yet. You might have a clogged port. And if it did change, you still might have an occasionally clogged port if the code is inconsistent at turning on. If you’re trying the quick fix to not clean it, try switching the vacuum line running to the solenoid from the lower manifold port to the port on the top of the intake that is currently capped. Remember to cap the port you just pulled that line off of, or you’re just going to have a vacuum leak. With the solenoid still bypassed, see if your idle has changed. If it has, it likely means your bottom port is clogged up. If it didn’t, you could still have a clog in your vacuum line, and boost sensor might still be fine. So I would still recommend replacing the vacuum line before going out and dropping a bunch of money on a sensor that could be fine. Make sure all the ports are clean. Also, make sure that solenoid/sensor hose port is clean. It is not part of the upper half of the intake you just pulled off. While the upper intake is off, clean the EGR on the back too. You can also clean out the throttle body and idle air control on the front. When putting it all back together, replacing the gaskets would be a good idea. They only run about $15 total for all of them from O’Reilly or similar local store. Fixing this code is about vacuum, and a vacuum leak from a gasket is still possible. Some places sell kits that include all the vacuum lines. These aren’t cheap and might take a while to get to you. Replacing them piecemeal by matching sizes with random fuel/vacuum lines at the auto parts stores is the route I went. While you’re at it, buy some hose clamp sets to replace the not great, plier hose clamps that are OEM. If your car is like mine, you’re probably missing a few anyway. The hose clamps are also useful when the hose sizes aren’t the perfect size, which if you’re eyeballing it at the parts store, they’re not going to be. During this, also replace the PCV valve and the PCV valve grommet on the valve cover. Buy the correctly sized one, Amazon has it for $4. The “compatible” ones that the autoparts store might try to sell you are not correct, and will cause a vacuum leak. One thing to note replacing these hoses, the brake booster vacuum line has a check valve in it. Makes sure to pull it out of the old hose and put it in the new one the correct direction. It’s very easy to not notice this. Finally, once that’s done. Reset the check engine light once more. Drive around and hope for the best. If it still is showing up, and you didn’t get the boost solenoid, buy it now. If you did, go back to the start and test the boost sensor/MAP again by bypassing the solenoid and maybe biting the bullet and buying the sensor. Most of the forums strongly recommend only getting the OEM for that sensor.